The THDSS is the first stainless-steel concrete anchor available in 5/8" and 3/4" diameters! Our code-listed Titen HD heavy-duty screw anchor is available in Types 316 and 304 stainless steel to resist corrosion and maintain the structural integrity of concrete. Type 316 is the optimal choice for applications in corrosive or severe environments such as near chemicals or salt water. Type 304 is a cost-effective solution for less extreme applications, including in wet, moist or damp environment. Want to learn more about the differences between Type 316 and 304 stainless-steel applications? 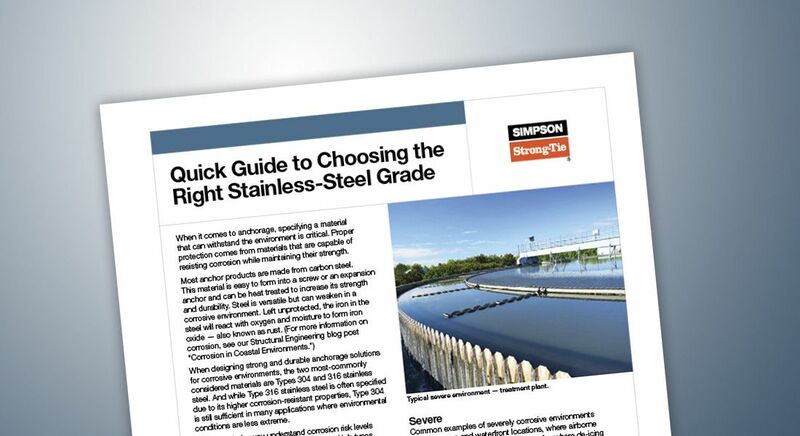 Fill out the form below to receive our Quick Guide to Choosing the Right Stainless-Steel Grade. The THDSS corrosion resistant screw anchor gets its cutting ability from a proprietary bi-metal design that incorporates a carbon-steel helical-coil thread brazed into the shank of the anchor. The innovative serrated carbon-steel thread effectively cuts the concrete while significantly limiting the amount of carbon steel in the anchor. Other stainless-steel bi-metal anchors are made by welding a full carbon segment onto the end of the anchor to facilitate cutting. With time, the carbon-steel segment embedded in the concrete is vulnerable to rust. As carbon steel rusts, it can expand up to ten times its original volume, cracking and damaging concrete, especially if installed near an edge. The minimal carbon-steel content of our THDSS greatly reduces the likelihood of concrete damage due to corrosion. All of this adds up to fast and efficient installation, combined with long-lasting corrosion resistance. If you'd like to learn more, fill out the form to get the Quick Guide to Choosing the Right Stainless-Steel Grade.